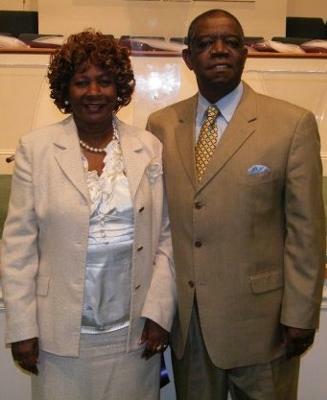 To my bishop and overseer whom I choose to call Daddy and Moma Blake. You have truly been a blessing to me,my children,and my mom's life. There are not enough words that can express how much you have planted,given,and sown into my life with your acts of kindness,time,and words of comfort and prayers. You are truly a living example of what God 's LOVE is and I would like to dedicate this poem to my Bishop and Overseers Drs. Israel & Barbara Blake in celebrating 32 years of service in the ministry. That angels planted, then God chose. To help us through our trying days. And lives the meaning of the cross. And loves us when we're at our worst. And builds us up with words of praise. Have helped so many to repent. Are pastor and his faithful wife. I just want to let the world know how much I appreciate and honor two loving and caring pastors who truly not only speak but LIVE by what they teach and preach. Again I say I love you "Daddy & Moma Blake" and I pray that God will allow you to see many more anniversaries.